Hate a cluttered nightstand or desk? How about an iPhone charger that’s invisible? 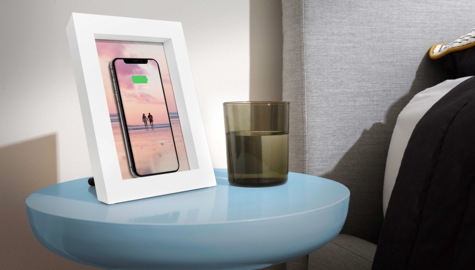 By itself, the PowerPic is a handsome photo frame. Prop your phone in its recessed edge and an induction Qi charger built into the back of the frame magically begins charging it. The frame is made out of New Zealand pine with a soft semi-gloss white (or black) finish. Simple clips open the back to accept any standard 5 x 7 photo. The Qi-certified charger delivers up to 10 Watts from the power supply that came with your phone. The charger works with cases up to 3mm thick so you can leave your phone in its case. PowerPic includes a USB-C to USB-A cable so connection to your phone’s charger is simple. There is a secure metal leg with a rubber tip protruding from the back of the frame. This provides stability if you need to manipulate your phone while it is in the frame. A tiny LED on the back indicates charging status. This lovely frame and charger is not cheap, but like other Twelve South products, it is an innovative concept coupled with great design. Build quality is exceptional and a charger like this solves a handful of problems — it charges your phone, it eliminates clutter, and with a photo of your family or loved ones, it is a handsome addition to your bedroom or workspace. MyMac Reviews rating is a solid 9 out of 10.